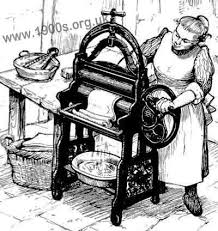 When you hear the word mangle you probably think of something all smashed to bits but to your great, great Granny she’d have immediately thought of something equivalent to a washing machine come ironing board. The mangle or the wringer as it was also known, was quite the revolutionary time saving labour device that women in the 1800’s had been crying out for. Before the mangle came along the housewives and washer women had to use their bare hands scrubbing clothes in hot soapy water on large pumice stones or wooden wash boards. This was a tiresome and time-consuming job. At least you don’t have to worry about that happening with your property cleaning especially if you contact this Commercial Cleaning Company Cheltenham at cleaningcompanycheltenham. They can make some suitable arrangements and none of it will involve lugging a heavy metal cleaning object up the stairs. The Mangle was two solid wooden rollers housed in a metal frame. The name mangle is one of those words that have changed its meaning. Whilst we see it as being something destructive to our ancestors the word mangle related more to the Latin word manga or axis and engine as we would now interpret it. To save all the scrubbing the clothes were washed in the hot soapy water but with the mangle all that the lady needed to do was feed the clothes in one end and then turn the mangle handle back and forth so that the they were rolled between the wood or, later on when the technology was there, compound rubber rollers. Yes, it was still a rather boring job but at least you could do several bits of clothes at once and it saved a lot on your hands. The added advantage of using the mangle was that you not only pressed out the stains with constant movement, much like a modern washing machine, but you could also dry the clothes as well or at least reduce the amount of time that you had to put it out on the line. The invention of the washing machine and its spin cycle made the machine redundant but you might still see some knocking around in use. It was the only means of washing the Housemates clothes in Big Brother one year. « Using the Soda Crystals like your Granny used to do.